It’s important to have good body alignment, not just when we exercise, but whenever we move our body. When our muscles contract they pull on the tendons, which move our skeleton. Good body alignment supports efficient muscle contraction, which in turn supports our balanced skeletal structure. We cannot have one without the other. Aside from the proven physiological health benefits associated with exercise, the entire point of exercise is to strengthen and stabilize the skeleton enabling it to function effectively. 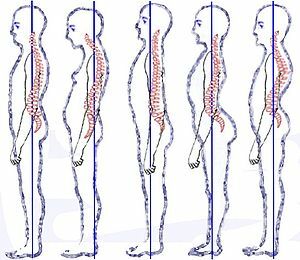 Not paying enough attention to this basic principle loads too much pressure or stress onto unsuspecting joints, pulling us out of functional alignment, which can lead to pain or injury, and sometimes an unflattering physique. The primary reason most people exercise is to look better and improved health takes a close second. If our goal is to look better then why do we punishingly force ourselves to execute movements without paying attention to how they are performed? It’s because we are thinking too much on completion as opposed to the precision of movement. Most people I know are hard workers and are willing to try just about anything for the end result. But what if all that hard work turns out to be for nothing? What if mindless or forced repetition with poor body alignment is causing more damage than good? What is the solution? Like any type of movement, if you do not know what correct body alignment is, how can you monitor yourself? Enter the domain of the expert: Personal Trainer, Physiotherapist, Registered Massage Therapist etc. These professionals reinforce, remind, and educate the client on proper technique and body alignment, be it for daily function or athletics. Clearly I am biased, but in general, I believe in learning from an expert. And it is quite clear how I feel about putting health first. We all know that without our health we have nothing. Unfortunately, it is often the case that before we come to this realization and do something about improving our health, we suffer serious illness or injury. The following is from personal experience as an example. Having taken the mandatory swimming lessons in public school, I have always been able to swim at a recreational level. Two years ago I joined a masters swim group, which met once per week for an hour of drills and stroke improvement. Being a ‘land athlete’ all my life I was nervous about joining this group, but getting over this fear and really learning how to swim was another goal to strike off my to-do list. When refining or learning something for the first time, there are many layers and many A-HA! moments along the way. So, what does any of this have to do with body alignment? In a group class there is only a certain amount of individualized attention a coach or trainer can give each student. As a beginner swimmer, the amount of feedback I got from my coach was more than adequate. However, as I put these corrections into practice, I developed some elbow and shoulder joint irritation. I started swimming a second day a week (for half an hour) at a moderate intensity, just to practice these corrections. I later found out, that I misunderstood some of the corrections and was doing something else entirely wrong. But this is what I am talking about when I give the ‘layers’ analogy. We learn more and make progress, only to discover there is an entire other layer of lessons waiting, and more lessons beyond those. Learning is an endless process, which for me is what makes learning so exciting. I cannot imagine it would be very fun if we did everything perfectly the first time. When checking in and complaining about these new pains with my registered Massage Therapist, it was he who identified the problem and was able to give me direction as how to correct my technique. What is fascinating to understand is that my technique was faulty because of a very small, over-tight, muscle (teres major), which affected the mechanics of my shoulder from rotating properly. About five months ago I stopped going to the masters swim group and instead started meeting a swim coach once every three weeks for a half hour of technique drills. The rest of the time I have to be strict about going to the pool to practice on my own. The point is that without these individual lessons that focus on my particular needs, and the support from a registered Massage Therapist, I would continue to irritate my elbow and shoulder joints because of the high frequency of incorrect repetitive movement. This brings me to my second point about short-duration training. None of us can expect to push our bodies for long periods of time without losing form as a result of fatigue. Generally, a person who is more fit can train longer, but it is still possible to be fit with poor technique. It all comes back to balance. Are you stretching enough to counter all the strengthening and tightening? Are you stretching properly? Are you forgetting to stretch some parts of your body just because you don’t know how or because you don’t even know they exist? In a nutshell: focus on precision of movement. Exercise consistently and for short periods of time. Stretch your body daily. Get professional advice and support from certified and registered practitioners. And most importantly give your body ample time to rest and recover between intense workouts.